Inder Loves Folk Art: Comfy pants. Hello readers and happy October! The weather here is changing, and as you can see, the pumpkins are out and we are photographing indoors again (although we haven't actually turned on the heat yet; we put that off as long as we can). I am happy to report that making Joe a Buttoned-Up Button Down brought my sew-jo back full force! (To be fair, the change in seasons probably helped too - hot weather with no air conditioning makes sewing seem pretty unappealing.) After complaining about my swelling stash all summer and avoiding it, I decided to tackle the plastic bin of knits in my living room HEAD ON, with some Ottobre sewing for the kids. Ottobre Kids magazines are packed with fun knit patterns, and I've found it's easiest to do a ton of tracing all at once, cut out multiple knit items, and then assembly line sew them on my serger and coverstitch. This allows me to try out new patterns (which is fun and keeps my mind occupied) and whip up a lot of practical clothes for my kids in one big go. I cut out and sewed seven - yes, seven! 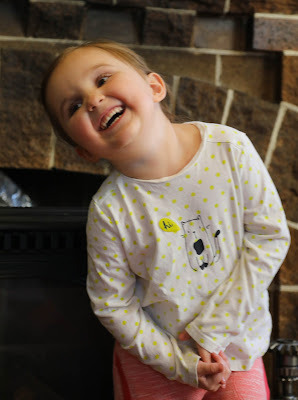 - pairs of leggings for Maggie, two pairs of sweatpants for her, and two dresses. Joe is getting two pairs sweatpants (and I have fabric for a few more this winter) and three t-shirts. I can now fit my kid's knits into one plastic bin instead of two, and I might even be able to justify buying some that lovely Nosh fabric everyone is raving about at some point - after I tackle the knits meant for myself, anyway. I am still working on Joe's items (the items were divided up by serger thread color, and we are on the blues), but today I'm here to share my most wildly successful Maggie make so far: SUPER COMFY PANTS. 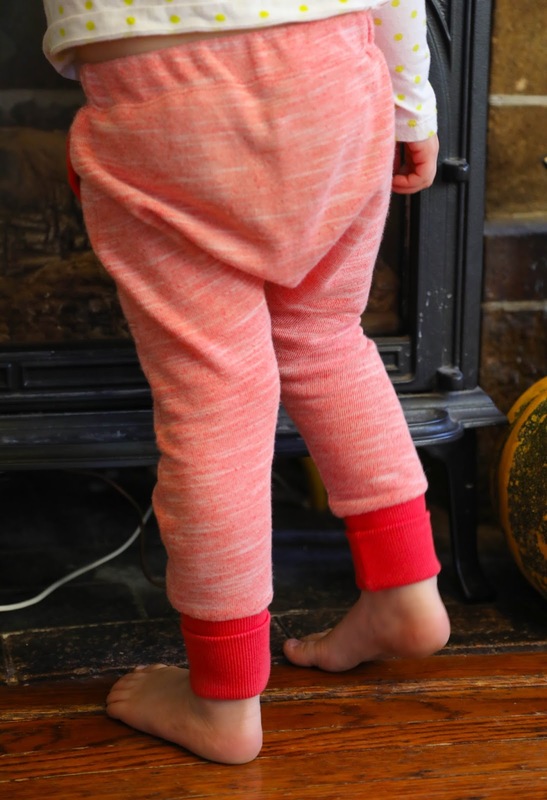 These are the "Slim-Fit Leg" sweatpants from Ottobre 1/2017 (Pattern #17), which is a great issue of Ottobre and inspired my mini-wardrobes earlier this year. 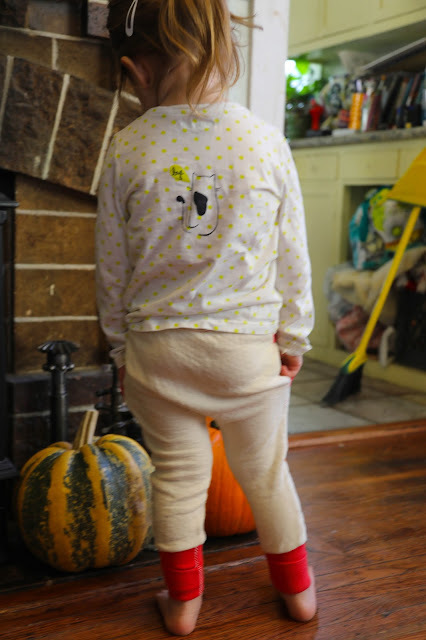 These cute sarouel-style sweats are shown in grey on a little boy in the magazine, but the pattern is obviously unisex. They have just one piece for the front and one for the back, a fold down waistband, and cute round pockets with ribbing and topstitching. I cut these out in size 98 (roughly equivalent to size 3). 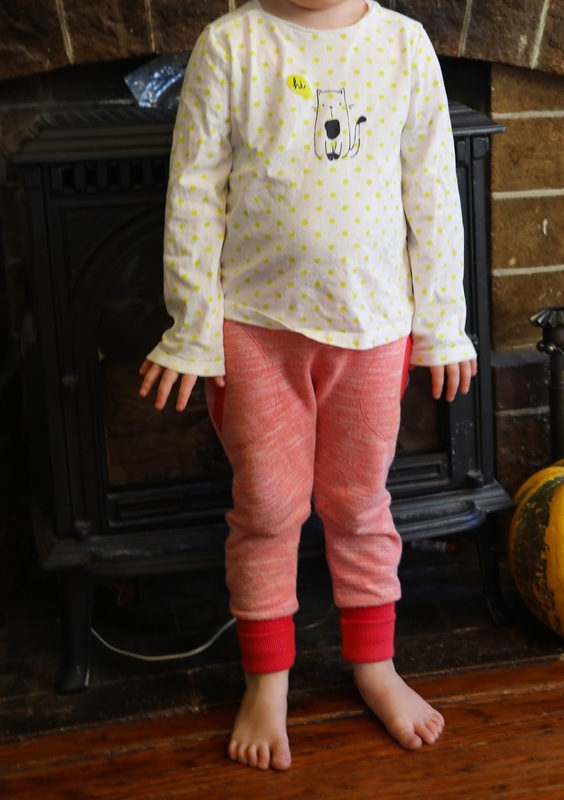 They fit her perfectly, although based on the other size 98 items I made for her, I'm realizing she has grown a bit and could generally do with a bit of extra length. I thought they looked a bit goofy when I laid them flat, but Maggie LOVES them, weird baggy bottom and all. 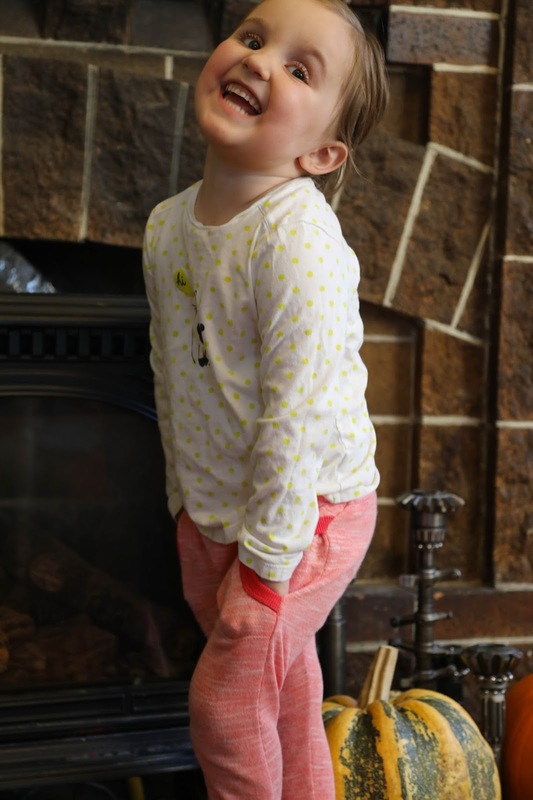 Maggie says that the ribbing around her ankles is her favorite part, because it makes the pants "really warm"! Sorry for the so-so photos, but yeah, these have been a major hit! I made two pairs, one in this lightweight mottled pink french terry I got from the bargain bin at Stonemountain (and still have a ton of, sigh), and one in a thick warm cream fleece I got second-hand at the Depot for Creative Reuse. I am especially glad to use up some of the cheaper impulse-purchase fabrics in my bin, because, basically, I bought too much of them and I am sick of looking at them! I don't know when I will learn that two yards of 60" knit is way too much fabric if I'm planning kid stuff. Both pairs of sweats use the same salmon-pink bamboo ribbing I got at Stonemountain. I swear by this stuff. It's super stretchy, has excellent *pop* (recovery), it behaves itself while sewing, and they have a decent selection of colors. And a half yard will provide ribbing for four or five projects - maybe more! For the cream pair, I used dark pink thread for topstitching. Both pairs of sweats were constructed entirely on the serger and coverstitch machine. These are by far the biggest hit from this latest sewing binge. Maggie would wear these every chilly day (and night, and next day) if she could. Finally, Joe and Maggie can lounge in their sweatpants together, right? She says these pants are the "most comfy pants ever!!!" I will leave you with some gratuitous Maggie cuteness! Maggie's smiles light up our house (and anyone who happens to be nearby); and when Maggie's not happy, ain't nobody's happy. She is funny, smart, chatty, and snuggly. She loves to help me with all my craft and sewing projects (and constantly suggests more), so I suspect she's gonna carry on the family tradition of craft! She loves cats and hates dinner (unless it's pizza). She still crawls into bed with me most nights, where she proceeds to kick off the covers and kick me all night, but her cheeks are so kissable I don't even mind. She's the bestest!! 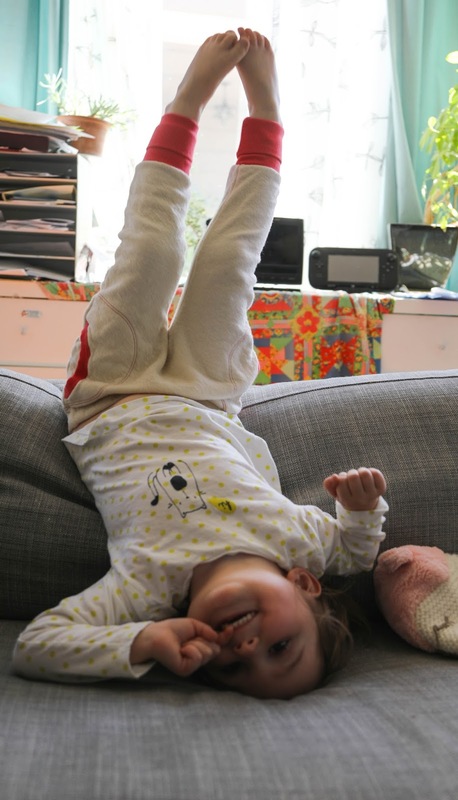 She likes to watch TV or just hang out on the couch upside down, like this. No, seriously, she's like this a lot! And these are the perfect pants for this type of couch-yoga. I'll be back soon with some Joe sewing! Is your sew-jo seasonal? Discuss! Yay for comfy pants, Maggie is so cute! Love these! Go sarouel-style! And Maggie is so sweet and effervescent. Oh, I'm glad you got your sew-jo back! The pants are adorable - the ribbing is great and those pant cuffs do look so cozy! I can't wait to see the rest of it. I can't think of the last time I lost my sew-jo; over the last few months I've not had as much sewing time as I'd like, so I always have something I need to make. But I do tend to sew for my kids in giant spurts like the one you are describing. 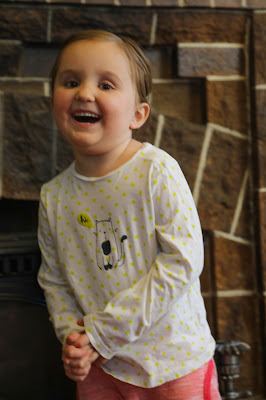 I recently finished three sets of pajamas for my boys and two nightgowns for my girls. I have to sew up the remaining two sets of pjs that I cut out, plus a pair of leggings, and then I really need to make a few more pairs of leggings and another set of pjs. 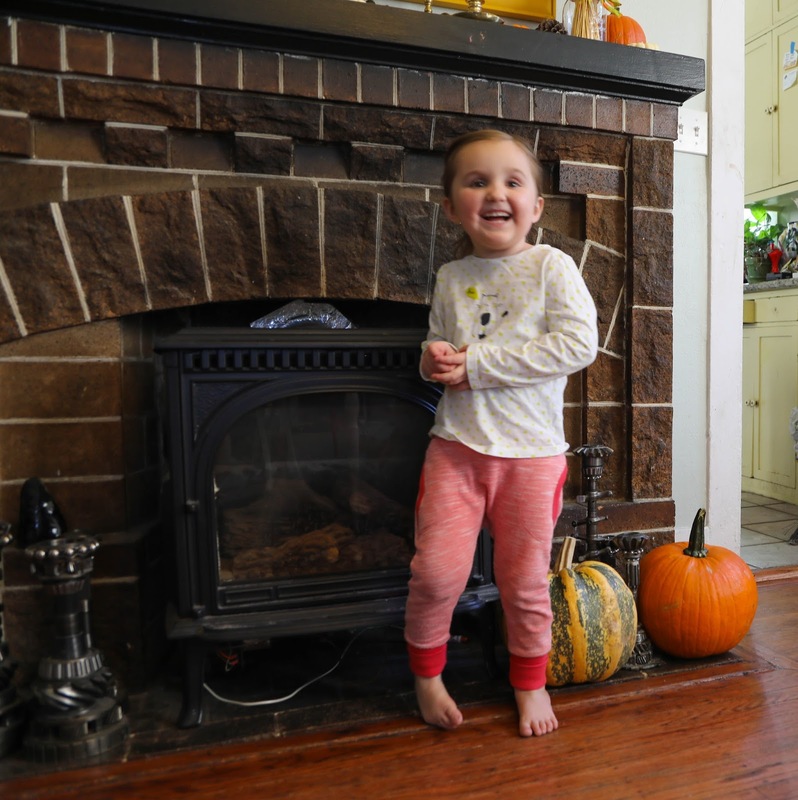 And actually, now that I think about it, my kids do tend to need a pile of new stuff in the fall - more than they do in the spring. SO maybe it is seasonal. In any case, I'd prefer to be sewing jeans for myself but I think I have to put that off until I finish the current set of needs. As for the knit fabric, I agree that 2 yards is too much, but since I'm constantly sewing pjs for my kids and tees for my boys, the remainder of the yardage always gets used up. I save scraps for neckbands and appliqués, so I generally use that up too. I'm actually coming to the end of my current kid knit stash, so I need to replenish! First - I give you serious credit for binge tracing Ottobre patterns. That is my least favorite part! I love the pants for Maggie. They are totally adorable! I love the contrasting ribbing! So glad your sew jo is back and I can't wait to see your other makes!